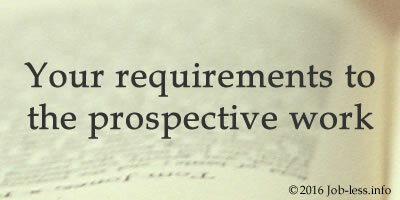 Article #4: Your requirements to the prospective work. The list of requirements which you impose to estimated job and the employer is certainly extensive and various. Mainly, there are, certainly, financial issues - regularity and size of salary's payment. And let's consider what else. In order to make your dreams come true, first of all think of what you are willing to offer the employers. Those, who have a solid professional experience, usually don't feel any difficulties with the answer to the question, concerning their possibility. But the beginners, looking for a job, are usually in pessimistic mood: "I am not able, and nobody needs me". Be sure, you are wrong, estimating yourself so categorically. For a start, take a blank sheet of paper and try to remember everything about yourself. What education do you have; in what subjects, had been studied at school or institute, you achieved the greatest success. Add to this list the various study groups and facultative classes that you have attended, participation in conferences and competitions. Don't hurry immediately to underline, that you have no professional experience. Perhaps, you've helped someone with the organization of own business, have made urgent calculations, and have typed several large texts. Or, maybe, you were on trainings, earned additionally during vacation, did practical work, etc. Try to evaluate objectively your professional and personal qualities. Should pay attention what family and friends say about you. Perhaps, you don't agree with their comments, but you shouldn't mislead the employer by your "sense of duty and accuracy" if you don't possess such merits. We hope that such comprehensive analysis of the opportunities will allow you to gain self-confidence and to define, where it is better for you to look for job and what professional skills you lack. Now you can formulate the requirements to future work. But firm's and your official post's stability aren't the same thing. There are organizations where high fluctuation of the personnel is the part of their corporate culture. The average duration of their employees varies from two to six months. Besides, even very stable companies endure the periods of reduction of the staff and disagreements between founders, etc. The remoteness of the future workplace from your house. Wasting 3 hours every day in a city transport's tripping to one side, for the majority of workers is impossible. However, an hour on the road to the job is quite normal for most inhabitants of large cities. But there are different cases. As, for example, one girl - the graduate of currency cashiers' courses with no work experience, refused very attractive offer, as considered that she wouldn't be able to spend an hour and a half on the way to probable job place. Despite even long HR specialist's persuasion that it's a rare good luck for her, because such working conditions and such salary to the beginners aren't offered. The girl remained with her own opinion, and missed a good chance. In some companies delay after the working day aren't welcomed. It is considered that you can't plan and organize job correctly. But in many organizations there is other point of view. At work usually delay secretaries (their time depends on the chief), HR managers (10-12 interviews a day, but also the paperwork!) and others. If you find yourself at the company where there are no restrictions of working hours, you should either accept such conditions or immediately refuse to work in this organization. Your statement of intending professional growth is worthy of respect. But sometimes it is not coincide with the employer's purposes. For example, some of them prefer workers who simply like exactly this job - in order to avoid frequent change of employees. High requirements to a social package are justified only if you are one of the highly professional experts, applying for responsible official posts. While, it is a little bit strange to hear an extensive list of such benefits from the unskilled novice. You may express specific wishes about the age of its members (youth, middle age, etc.) or composition (mixed or else). But, getting a job, remember that the professional qualities of the applicant are most estimated there. Of course, employers pay attention to your capability to "function" in a team, adapt in collective, and non-conflict nature, but "a good person" is not a profession. The chief, as a rule, demands from the subordinates to carry out the instructions, sometimes without any explanations. Get used to find and correct own mistakes, and then the number of problems would significantly decrease. You should notice that loyal and democratic leaders usually have rigid and authoritative deputies and vice versa. Such is the law of balance in the nature and management. The list of applicant's requirements to the future work doesn't end on it, but try to reduce them to a reasonable minimum and to come up with compromise solutions in case of answer: "No, we can't promise this to you".